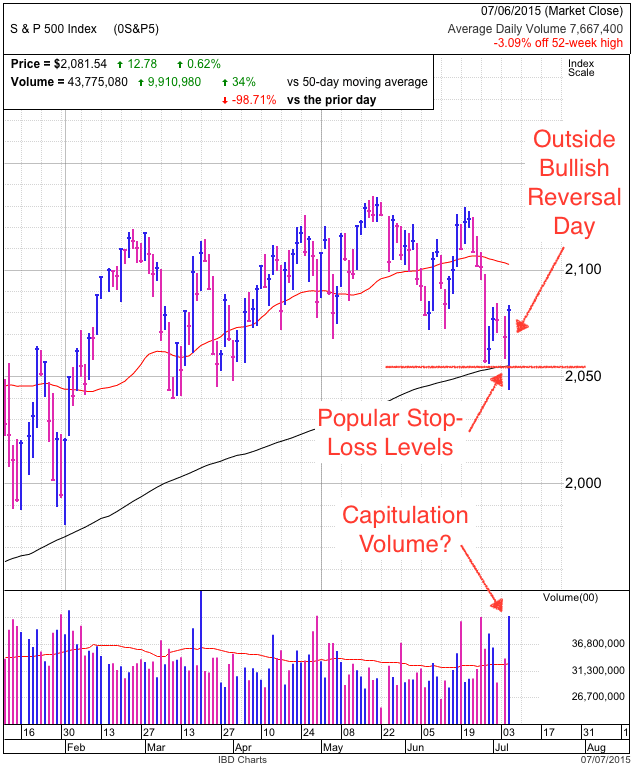 The S&P500 extended Tuesday’s rebound and reclaimed 2,100 support. Volume was above average for the sixth consecutive day and shows there is far more participation in this market than the typical, dull summer sessions. Chinese and European fears are fading fast. We passed the halfway point in earnings season without major problems. And the Fed is sticking to their script. In all, things are becoming boring, but given where we came from, boring is good and that is showing up in stock prices. No matter how many reasons people have for not liking this market, prices are within two-percent of all time highs. When forced to choose between the crowd and the market, I always go with the market. It isn’t that the crowd is stupid, only that their opinion is already reflected in stock prices and there is nothing to be gained by trading with the crowd. Contrary to popular opinion, prices don’t have to go down to price in bad news. Another way is by not going up. We’ve been in a tremendous bull market since the 2009 lows, but 2015 has been a dud as we’ve done nothing but drift sideways. Few would argue with me if I said this market would be significantly higher if we had been showered with good news. While we haven’t seen the 10% or 20% correction everyone is predicting, the difference between where we are now and where we would be if the news was better, is our “correction”. This market has been given every opportunity to breakdown. If it was poised to go lower, it would have happened already. When the prices refuses to go down, no matter what our analysis or gut tells us, stick with the market. The S&P500 slipped modestly following disappointing earnings from AAPL and MSFT, but it wasn’t all bad. Even though these titans of tech shed billions in market cap, the selling didn’t spread much further than the tech sector. If the market was overbought, this was more than enough of an excuse to breakdown. How contained the selling was shows owners remain confident and are supporting these prices. This resulting tight supply makes it easier for the rebound to continue to new highs. It is no surprise that we pulled back following a 89-point run from 2,044 to 2,133. There is nothing concerning about this move because it is normal and healthy. Finding support at 2,100 and the 50dma is the obvious level, but chances are we won’t make it that far given how benign today’s selling was. 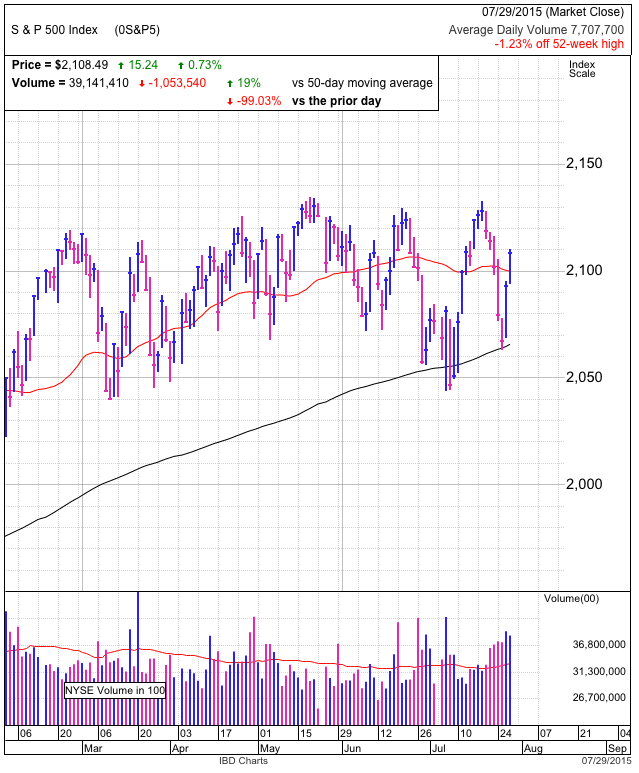 The S&P500 produced minor gains for a second consecutive day following the impressive, 90-point rebound from the 200dma. We closed just under all-time highs as European and Chinese fears fade from memory. This calm tells us both sides are happy with their positions and not many participants are changing their mind. Those with stock continue holding for higher prices while those with cash are not interested in chasing a “straight-up” move. That means we trade quietly until one side gives in. The “end” of the Euro and China crises lead to a sharp recovery that humiliated bears. Their short-covering provided a material portion of the demand that pushed us back to all-time highs. But in recent days the dip buying and short-covering has slowed materially. Powerful breakouts are built on a surge of traders climbing over each other to avoid being left behind, but that isn’t the case as we approach old highs. Even huge moves in NFLX, AAPL, and GOOGL failed to excite the broad market. Rather than accelerate, gains are slowing even though the news keeps giving us reasons to buy. This tells us demand is falling off. By itself, this is not a reason to be bearish, but it shows there is less upside pop left to this move. 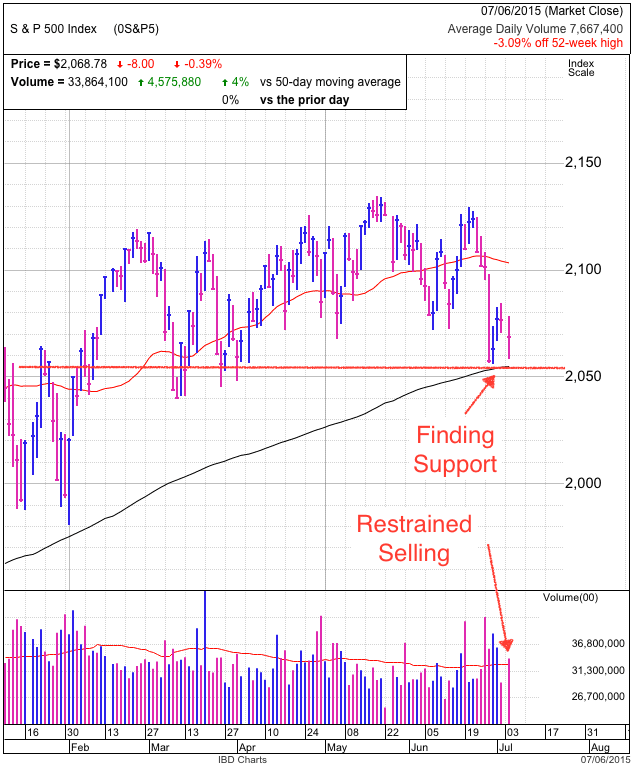 Constructive price-action through Wednesday shows solid support behind these prices, but it wouldn’t be a surprise to see us dip back to 2,100 support and the 50dma. Institutional money hates buying after big moves and feel better if they can get even a modest discount. In a self-fulfilling prophecy, their lack of buying often leads to a dip. But no matter what happens in coming days, the market is poised to breakout into uncharted territory in coming weeks. The S&P500 traded in a tight range as Greek politicians debated the merits of an oppressive bailout and Janet Yellen testified in front of Congress. Given the magnitude the issues being discussed, it was a fairly benign day for the markets. The calm shows us most of the nervous and emotional selling already happened. The current crop of owners demonstrated a willingness to hold volatility and uncertain headlines over the last several weeks. This confidence keeps supply tight and props up prices. While rate hikes and Grexits are old news, the situation in China is entirely different. Greece is tiny and most financial institutions long ago insulated themselves against a Greek default. And for the Fed’s rate hikes, going from 0% to 0.25% is trivial in comparison to the 3% historical average. Problems in China, that is something our market is definitely not prepared to deal with. A recession in the world’s second largest economy would leave a gigantic hole in global growth. That is why traders fretted last week when the Chinese stock market plunged 40% from its recent highs. Luckily their stocks bounced sharply in recent days and this crisis fell off our front pages. That relief allowed our 60-point rebound. Should we worry about China? Should we ignore it? What should we do? Let history be our guide. Assume for a moment that China’s stock market is in the later stages of a NASDAQ, dot-com style bubble. If that’s the case, China’s selloff has a long way to go to match the NASDAQ’s 80% plunge. Clearly we should be panicked and sell everything, right? Not so fast. Markets hate being predictable. When everyone claims the bubble is bursting, what is the market going to do? You guessed it, rally sharply. While it seemed like the dot-com bubble imploded overnight, the NASDAQ actually took three years to find a bottom. That collapse is many things, but fast is not one of them. More interesting for us is how the NASDAQ plunged nearly 40% from the highs over a couple of weeks. That sounds eerily similar to China’s recent meltdown. 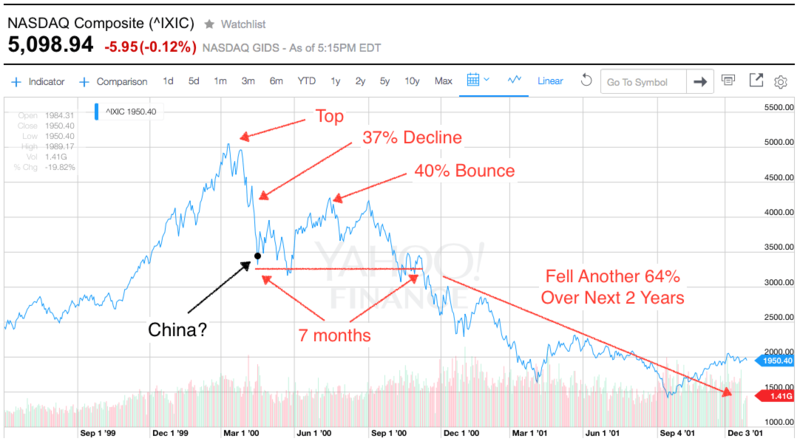 So what happened next in the NASDAQ? It rallied 40% and held those early lows for another seven months! Just when everyone knew the bubble was bursting, the market found a bottom. If history were to repeat itself, then at least over the near-term, China found a bottom and we don’t need to worry about it…..for now. Six months from now is when we need to reevaluate, but in the meantime enjoy China’s reprieve. 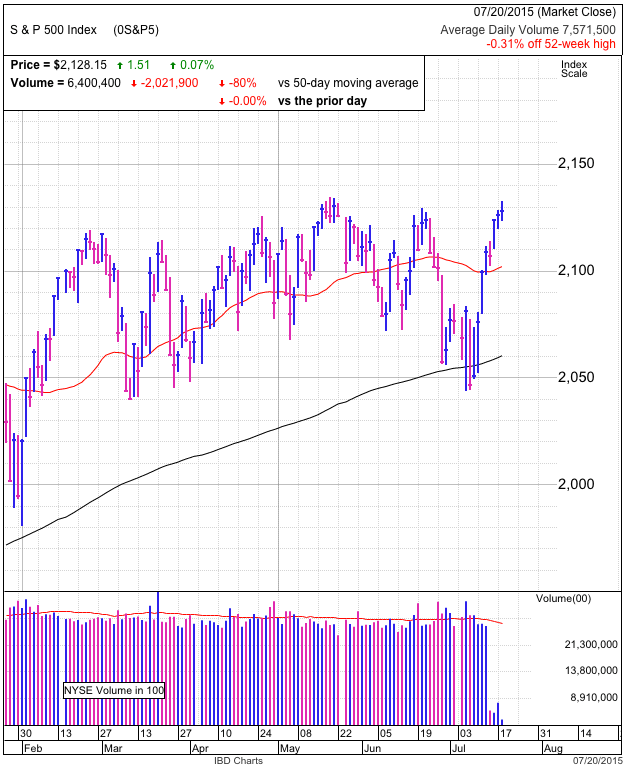 It was a good day for the S&P500 as it broke above the two-week old, 2,050 – 2,080 consolidation. It seems reality in Greece and China is less bad than was feared last week. This move leaves us just shy of 2,100 resistance and a declining 50dma. Our stock market has been flat through the first half of the year. Depending on who you ask, this is either pausing and refreshing, or stalling before rolling over. Technicals are little use in settling this debate because pausing and stalling look the same on a chart. The answer lies in sentiment and supply and demand. More specifically, understanding why the market is flat. Are we failing to make new highs on good news? This is the classic “overly bullish” top and signals stalling because we are running out of new buyers. Or is our market failing to selloff on bad news? That points to refreshing because bearish headlines flush out weak hands and replaces them with confident owners who keep supply tight. Everything is debatable on the internet, but for the objective crowd it is hard to claim the market has been showered with bullish headlines. Greece, China, rate hikes, lowered earnings estimates, and all the others. Bears have been feasting on almost universally bad news. If we were not allowed to look at charts and only went by headlines and sentiment, it would be easy to assume we are in the middle of a bear market. Short interest is the highest it’s been since the financial crisis and AAII bullishness is 10-points under historic averages. But yet here we are, two-percent from all-time-highs. What gives? We could argue headlines and fundamentals don’t support these valuations and the market is on the verge of a collapse. The problem is that is arguing with the market. Right or wrong, the market is far larger than we are and will always win every single argument. In my opinion, it is quite clear. When the market doesn’t sell off on bad news, that is bullish. End of story. No doubt the we will eventually fall into a correction, it might even happen soon, but it won’t happen for all the reasons people are talking about. It was another frustrating day for the S&P500 as early strength faded into the close. We opened 1% higher following a monstrous rebound in the Chinese stock market. But rather than embrace the strength, nervous and regretful owners quickly jumped on the opportunity to sell higher prices. While we didn’t dip under Wednesday’s lows, we came darn close. Shortly after our markets closed, all of Thursday’s price-action became irrelevant when Greece finally produced a palatable proposal that includes most of the austerity measures European leaders demanded. By itself that was enough to push index futures up three-quarters of a percent. But then the news got even better as China kicked off Friday’s trade with another gangbusters open. That nudged our futures above one percent. Futures are often misleading and plenty of glitches can occur in China and Greece while the Western Hemisphere sleeps. But for the moment, the situation in China and Europe are looking less bad than was feared in recent days. This is a great example of why we should trade against the herd. Sell when people are confident like they were two weeks ago, and buy when they are fearful like they were today. It is against our natural instinct to go against the crowd, but there is a big difference between the skills that allowed us to thrive in the wild and what it takes to be successful in the markets. Barring an overnight calamity in the Eastern Hemisphere, we should have another nice open Friday morning. Hopefully it sticks this time. But if sellers take over again, that is not a good sign and it tells us the bottom is not in yet. That doesn’t mean we need to join the panicked selling, but at least be prepared for a little more volatility. It was another dramatic day for the S&P500. A brutal morning plunge undercut recent lows, the 200dma, and 2,050. This weakness sliced through most technical stop-losses, triggering a wave of defensive selling. But not long after those waves of autopilot liquidation ran through the market, supply vanished and we launched higher, ultimately closing nearly 2% above those fear-induced intraday lows. Pundits claim the weakness was driven by this headline and the rebound motivated by that one. But the truth is far simpler than that. The market was acting in a predictable and typical way given sentiment, technicals, and supply & demand. Figuring out what was going to happen wasn’t that hard if we were looking at the right pieces of information. Sentiment is in the toilet following this weekend’s “No” vote. Most analysts put the probability of a Grexit at far greater than 50/50. Anyone expecting an orderly resolution to this crisis is clearly in the minority these days. But since a Greek departure is now the widely held view, we know most of the defensive selling already happened. It’s common sense that anyone predicting an imminent market collapse is already sitting in the safety of cash. That tells us any bout of fearful selling like we had this morning would be short-lived because there are so few people left to sell these “new” Euro headlines. Most of today’s weakness was fueled by technical stop-losses that defensive traders place near key price-points and moving averages. Undercutting last week’s lows forced disciplined traders to exit their positions. That selling then pressured others with stop-losses located near the 50dma and 2,050 to bail out not long after. But once we violated all the popular stop-loss levels, we ran out of new supply because only defensive technical traders were selling this dip. Since those that feared the Grexit already left, by default that means anyone still holding doesn’t fear these headlines and was uninterested in joining the herd selling. That’s why supply vanished and we launched higher after undercutting the last stop-loss level. While today’s outside bullish reversal suggests we are near the bottom of this move, the situation in Greece and China is far from over. We should expect near-term volatility to continue, but this is a better place to be buying weakness than selling the fear. Can we finally buy the dip? After a “No” vote over the weekend, Greece has never been closer to departing the Euro, yet the S&P500 dipped a modest 0.4% on average volume. Is our market being naive and irrational ahead of Greece’s financial collapse? Or is the Grexit already priced in because everyone who fears it sold a long time ago? Today’s price-action was constructive. Overnight futures cratered more than 1.5%, but as the sun reached our shores, the panic subsided. While we opened near last week’s lows, almost immediately the selling dried up and we rallied. Supply and demand wise, that tells us it is increasingly difficult to find owners still willing to sell the Greece story. The headlines were as ugly as ever, but few were willing to bail out at steep discounts. It would have been nice to see prices dip under last week’s lows, the 50dma, and 2,050 before bouncing. This would have flushed out the last of hope and triggered technical stop-loss selling, setting up a traditional double-bottom capitulation. We didn’t get that, but the market never behaves exactly like it is drawn up in the textbooks. Maybe this last leg lower will happen later this week, or maybe supply is so thoroughly exhausted that there isn’t enough left to form a traditional double-bottom. Anyone insisting perfect chart patterns will miss a lot of good trades and so we have to ask ourselves if this is good enough? The market was hopeful Greece and Europe would kick the can down the road two-weeks ago when it rallied to 2,130. Now that we find ourselves nearly 80-points lower, we can assume the dire headlines have convinced most traders to expect a Grexit. If the worst is already priced in, then this becomes a compelling place to buy because the potential upside far outweighs the remaining downside. While there could easily be a little more left to this dip, this is a far better place to be buying than selling.